I have been wanting to make roasted banana ice cream for what feels like forever. I finally got around to it this week and am totally smitten. 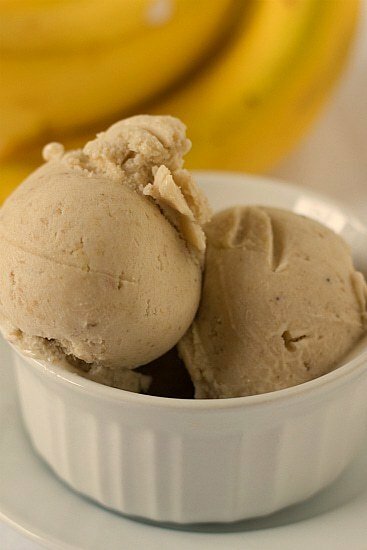 If you love bananas, you will positively fall in love with this ice cream. It basically tastes like a frozen piece of banana bread. And it doesn’t take much more work to make, amazingly. The flavor of the bananas really shines through – clean and fresh. 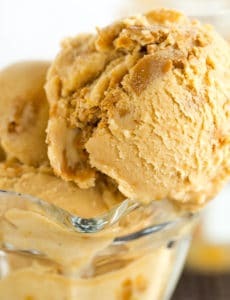 I am thinking that, just like with banana bread, some walnuts might be a great addition to this ice cream. I may whip up some candied walnuts to mix in next time. Banana makes for an easy base to play around with – fudge ripple, peanut butter swirl, candied nuts… all sorts of delicious possibilities! This is by far the easiest ice cream I have yet to make. It is not custard-based, so there is no whisking and cooking egg yolks with milk and cream on the stove. 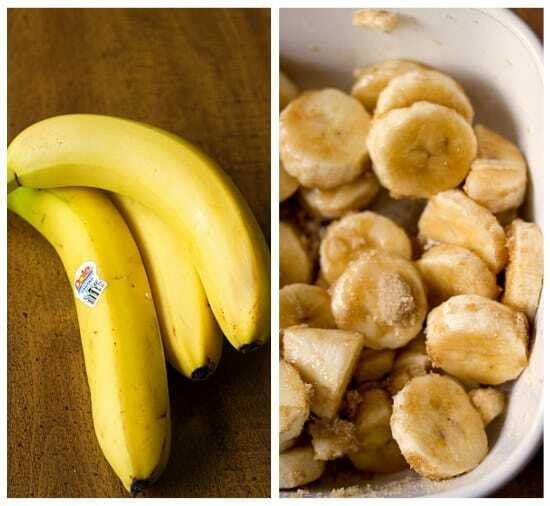 You simply slice up a few bananas, toss them with sugar and butter and then pop them in the oven to roast. While they are roasting, you will want to bottle the smell and make a candle or air freshener out of it. Guaranteed. Your kitchen will smell like a fresh batch of bananas foster. Which smells delicious. Once the bananas are out of the oven, you throw them into the blender with some milk and a few other ingredients, purée it together, and 30 seconds later your ice cream base is ready for its trip to the refrigerator to chill. Super easy! 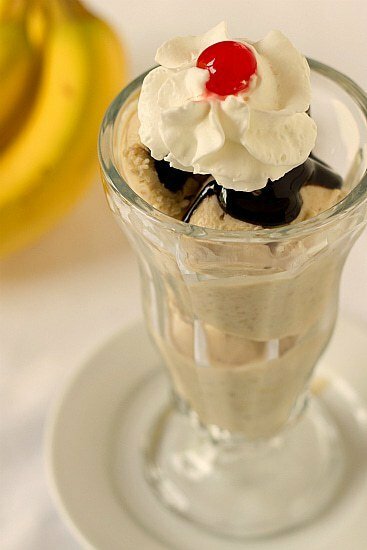 This ice cream also makes a fabulous base for your very own banana split sundae. Top the ice cream with hot fudge, whipped cream and a cherry. If you have crushed pineapple (which I didn’t have), throw that on top of the hot fudge. Or some melted peanut butter. Banana, peanut butter and hot fudge? Oh yes. I’m off to make that happen! 2. Slice the bananas into ½-inch pieces and toss them with the brown sugar and butter in a 2-quart baking dish. Bake for 40 minutes, stirring once during baking, until the bananas are browned and cooked through. 3. Scrape the bananas and the thick syrup in the baking dish into a blender or food processor. Add the milk, granulated sugar, vanilla, lemon juice and salt, and purée until smooth. 4. Chill the mixture for at least 8 hour (or overnight) in the refrigerator, then freeze it in your ice cream maker according to the manufacturer's instructions. 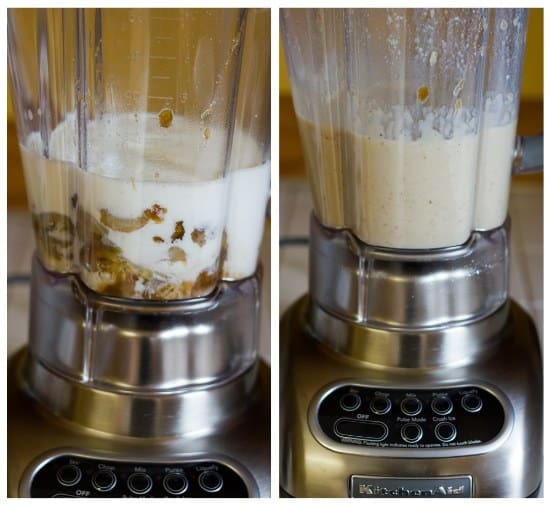 If the chilled mixture is too thick to pour into your machine, whisk it to thin it out. Quick question…did you use your ice cream maker after chilling mixture created from roasted bananas/milk etc or just put right into freezer? Hi Andrea, I used my ice cream maker! Do you think I’d be able to substitute almond milk for the whole milk? My husband is allergic to dairy but would love this! Hi Jessica, I think almond milk would work just fine! The roasted bananas were amazing.! First of all, the bananas I used were the ones that I grew in my backyard here in Florida. They changed from a very starchy not too sweet banana to something similar to sweet baked apple pie with a hint of caramel. I will definitely be using the first step in many recipes moving forward. for this recipe. So many sites just post and don’t give credit. This is a delightful recipe, much fewer calories I think. For other readers, f you don’t already have it, I highly recommend David’s book The Perfect Scoop. 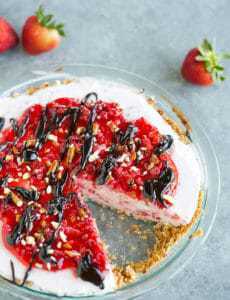 Have tried several of his recipes…so far the clear winner is his chocolate raspberry. My daughter lent me her ice cream bowl for kitchen aid stand mixer and I’ve turned into a crazy woman but my family are all enjoying the ice creams I make. Like a comment mentioned above, 40 minutes at 400 degrees was way too long in my oven. Just before the 20 minute mark, my sugar started to burn at the corners. I salvaged what I could, which is chilling now (! ), but next time I would cut the roast time down quite a bit. Hi, I was searching via google for a banana ice cream recipe, and I happened upon your blog. This recipe looks amazing. I’m not sure if you’ll see this comment, as I notice that the original post is a few years old at this point. But I have a question if you do happen to this: do you strain the ice cream base, either before or after freezing? I’m usually a fan of smooth, creamy ice cream — would this may not be the right one for me? Hi Rachael, I only strain custard bases in case there are any bits of cooked eggs that may have hit the bottom of the pan. I did not strain this. If you want a super-smooth ice cream with no texture at all, you’ll probably want to strain it. I want to make this without an ice-cream maker and I was just wondering, do I break up the icicles after letting it freeze for 8 hours? Thanks! I would probably do it every couple of hours to keep it creamy. So yummy! I made it with a can of full fat coconut milk because I am .lactose intolerant, and tasting it makes me want to eat it now! Why must it chill!!! Tested and approved ! Hummm, this taste of banana and caramel… It’s just perfect ! 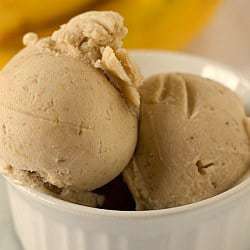 I just tested your Roasted Banana Ice Cream and it is really awesome! When I saw that Ice-Cream-Maker yesterday in the supermarket, I could not resist and buyed it. 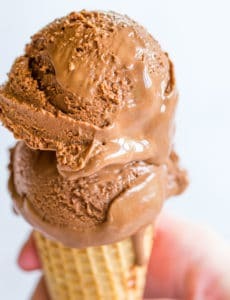 I wanted to test all the great ice cream recipes you posted here and I started with this one. The mix is in the fridge chilling, and the ice cream canister is in the freezer freezing. My bananas only took about 25 minutes to cook, they were soft and the caramel from the butter and sugar was getting close to being over cooked as well. Instead of the vanilla & lemon juice I used 1 Tablespoon of dark rum. Lets see how it turns out! I”m excited! I just made this tonight, and my husband deemed it “amazing!” :-) I also added some chocolate chunks and roasted walnuts, a la “chunky monkey”. OMG- imagine it with the peanut butter patties from the mix-in section of The Perfect Scoop- that would be bananas (pun totally intended)! Another winner! I was licking the blender clean and was almost tempted to lick the blades! lol Got it churned in the Cuisinart machine, frozen overnight and served to raves yesterday. I’m wonder what a Tbsp. or two of rum might do? I am also going to try this with roasted peaches and perhaps a splash of brandy. My ice cream maker has been on a shelf in the laundry room for two years, but not anymore. Thanks for your inspiring cooking. YUM! This looks incredible! I love anything banana so I know this is a winner in my books! This sounds so incredible!! I love roasting bananas and this ice cream is like a match made in heaven. Who knew? A little nutella swirl would be good too …. Roasting the banana first sounds like a great idea. It almost sounds as though you could make a bananas foster ice cream with this base. I am looking forward to trying this soon since we always seem to have a lot of banana around waiting to be used. omg thanks I so want to try this. Nice ice cream! I wonder if adding a slight bit of dark rum would be in order? I made this ice cream too and loved it!